This is part three of a multi-part series titled “Limiting Factors – A Genesis of Blood Doping”. It comes to FasterSkier from Sammy Izdatyev. You can read part one here, and part two here. The first discovery was that the athletes’ hemoglobin concentrations were borderline anemic compared to “normal” clinical reference values. Gösta Pettersson’s hemoglobin concentration was only 13.4 g/dl, and one male orienteer had an even lower number, 12.8 g/dl, which equaled hematocrit values around 40 percent and 38 percent, respectively. The strangest part was that their maximal oxygen uptakes were still very high and this was explained by the enormous amount of blood their heart pumped every minute. The highest figures Ekblom and Hermansen measured were so high that they re-tested the athlete to make sure they hadn’t made an error. The figures came back the same, but the highest cardiac-output figure was still too high to be believed by Ekblom’s colleagues. The research emphasized the importance of cardiovascular adaptation and tilted heavily to the validity of the “central” theory. When one Swedish journalist visited the GIH in 1969 to write about the laboratory, Ekblom mentioned the low hemoglobin concentration as an interesting phenomenon. The journalist speculated that it might be explained by iron deficiency, but Ekblom had a different opinion. In the midst of the blood-reinfusion studies, Ekblom obtained data that the human body aims to dilute the blood and that some well-trained athletes can have borderline anemic hemoglobin concentrations. He didn’t consider this any “real” form of anemia, but rather a natural and possibly a beneficial reaction to regular training. Ekblom still considered the theory behind the blood doping to be sound since earlier research had given some positive results. One item from unpublished blood-doping research found its way into this paper, as Ekblom and Hermansen noted former’s “unpublished observations” on cardiac output being elevated after blood donation, when the amount of blood was recovered but diluted. That is to say, the heart partially compensates for the loss of blood-oxygen carrying capacity by increasing blood flow above a normal level. The observations were made during one inconclusive blood-doping experiment. Nothing had yet been published about blood doping, and if a sharp-eyed reader of the Journal of Applied Physiology wondered why Ekblom had removed the blood of his subjects, he or she would find the answer a few years later from pages of the same peer-reviewed journal. While most people today, doping specialists included, are unaware of the preceding attempts to test the blood-doping hypothesis from the 1960s, there is a great deal of data available about this study since the detailed report was published in a prestigious journal. Blood infusion was now tested with two experimental groups, with significantly higher amounts of blood than was earlier used. Group I donated 800 milliliters blood that was reinfused 28 days later, whereas Group II donated 400 milliliters of blood three times at four-day intervals, totaling 1200 milliliters, and had the blood reinfused 32 days after the first donation. Ekblom said there hadn’t been a complex thought process regarding the storage period and amount reinfused, and by chance, they ended up with this protocol. Various blood and endurance parameters were monitored during the research. The key endurance test was the time to exhaustion, requiring the subjects to run as long as they could, and maximal oxygen uptake was also measured. As expected, both maximal oxygen uptake and maximal working time both fell significantly after blood donation. Hemoglobin concentration decreased by about 13 percent in Group I and 18 percent in Group II, and their treadmill-running endurance also collectively decreased by a third. 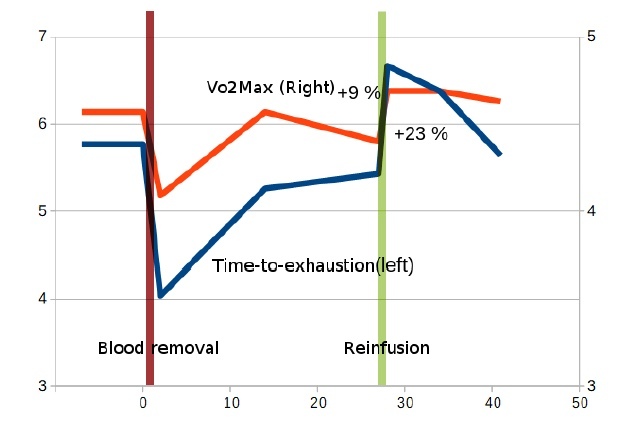 Bone marrow quickly began increasing red-blood-cell production, and when the blood stored at 4 degrees Celsius was infused four weeks later, there was an “overnight” improvement both in endurance time and in VO2max in the Group I. The authors noted the participants’ sudden 9 percent increase in VO2max and ability to run 23 percent longer on a treadmill. This is the blood-doping effect that shocked the world. Actual day-to-day competition remained vastly different than time-to-exhaustion while running, and it should be emphasized that the 23 percent improvement in the maximal working time in that treadmill test describes how much longer an athlete could run at given speed, rather than how much their speed could be increased at a given distance. The improvement in speed wouldn’t be of the same magnitude, and Ekblom himself told the Swedish media that steeplechaser Anders Gärderud could theoretically improve his 3000-meter steeplechase record by 10 seconds, and because his personal best (and the Swedish national record) at that time was 8:28.4, the “real” improvement in direct speed would be “only” 2 percent. Even when 2-percent improvement in speed, as well as improvement in VO2max figures, sound tolerable, they would have a serious impact on performance for reasons Ekblom would describe a decade later. Later, Ekblom went on to republish the data and figures on the 800 ml group, but the authors seemed unconvinced about the improvements in the 3×400 ml group, even when the improvement in the working time was similar. This led to a situation where there were only three subjects in the “main group”, which led to some anomalies. Goldbarg and Ekblom were surprised that maximal oxygen uptake had returned to the original level in 14 days, while hemoglobin concentration had barely risen from low “anemic” values and maximal work time was below the original level and hadn’t fully recovered even after 27 days just before the reinfusion. They had no explanation. Another interesting observation was that submaximal heart rate wasn’t lower after blood reinfusion, even when oxygen flow should have been sufficient at lower blood flow, i.e., lower heart rate. There had also been no increase in VO2max in “Group 2”, where the reinfused amount was 3×400 ml of blood, even when total hemoglobin had been increased by some 10 percent. While the researchers concluded that the results were generally similar among the groups, that incremental protocol was rarely used again in testing. 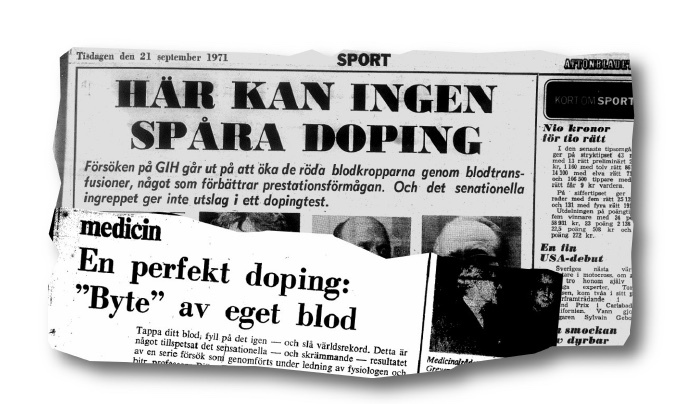 Additionally, when Ekblom described the research in detail in an article he wrote for the Swedish sports journal Svensk Idrott in 1972, he didn’t bother to mention the incremental group but focused solely on the 800 ml group and all the three subjects of this group also recalled their ”blood doping” research experiments later in various media outlets. While now there was a blood reinfusion study with improvement, the study was heavily prone to criticism for a variety of reasons and not alone for the reason that there were very only a handful of subjects. The most pertinent problem was that there was no ”real” control group because all the changes in the data were compared to earlier baseline values of the same people, which would lead to two types of future criticism. The first criticism was the placebo effect, when the participants might have known what the research was about and known not giving full effort after blood donation and perhaps an extra boost when they knew about the benefits of the extra red blood cells. You just take out some blood and give it back thirty days later that gives performance enhancement going from the last place in the race to the first. That has an enormous sport effect. That’s why the reinfusion of blood became so interesting in the media. That was not that much discussed in the scientific world as in the media. The effect of sports performance was, of course, something that the journalists found very interesting. While the subjects of Ekblom and Goldbarg were fit medical students with relative VO2max figures ranging from 54.9 to 71.4 ml/kg/min, there was always doubt whether the method would work on international-level athletes who were following rigorous professional type training programs and had reached the natural limits of their VO2max. It might’ve also been that the actual ”limitation” in the oxygen delivery chain might be different than that of even national-level athletes. While both Ekblom and Åstrand voiced concerns about the doping aspect publicly in the 1970s, considering it very likely that the method would also benefit elite-level athletes, they didn’t specifically touch the issue in their papers. While the researchers didn’t comment on the subject publicly while the research was ongoing, it wasn’t necessarily a secret considering the first attempt was revealed at the 1966 meeting of the Scandinavian Physiological Society in with a brief mention in its journal Acta Physiologica Scandinavica. Additionally, the prestigious peer-reviewed Journal of Applied Physiology had accepted the manuscript for publication two months earlier, therefore the “secrecy” would have been unsealed relatively quickly, in some 10 to 11 months. ”Here nothing can detect doping”; ”A perfect doping – ‘changing’ of one’s own blood”. While the blood reinfusion research had a scientific basis, the first two Swedish papers writing about the topic realised the future prospects immediately. One should also keep in mind that in 1970 there was no term blood doping and nobody knew how it would affect performance. It means also that it isn’t certain that the placebo effect existed that much when the subjects didn’t read too much into its known benefits, because there existed no known benefits, no literature, no sensational headlines, no succesful blood dopers to refer to. While Ekblom and the journalists were concerned that the practice would spread into sports, Ekblom was also interested in whether the method could be used to treat other medical conditions in more ordinary health care. He wasn’t able to determine that, but said he felt he contributed a “small piece” to the puzzle of understanding the premises that have significance on the mechanisms of the human body. Still, the sports issue troubled Ekblom very much, and he expressed that it would be undetectable. “To detect this type of doping is almost impossible,” he wrote in 1972 in an article titled, “Does blood doping become a sports problem?”. “Theoretically there would exist some possibilities for this, but it is not realistic in practical terms.” (Ekblom, 1972) He also states in the same article that blood doping would without doubt fit the definition of doping. *Historian John Gleaves writes in his essay about the cycling blood doping scandal of the 1984 summer olympics that this article ”brought the scientific debate over the benefits of blood transfusions to a North American audience of athlete and coaches interested in improving running performances” (Gleaves, 2015). Ekblom’s view was that the issue became ”of worldwide interest” only some five years later after the 1976 Summer Olympics (Ekblom 1982). Gleaves doesn’t find that much blood doping-related media material preceding the 1976. Not all were as dismissive as Jokl was. One of the first questions I had was that if this type of manipulation could be done on race horses and dogs, which is strange that it was not the sport people that called. Ekblom revealed to the American journal that he was offered 100,000 Swedish Krona ($20,000 U.S. dollars) for the exact method, an offer he refused. One journalist later claimed that this offer was made by a professional cycling team in order to help them with the procedure. (Byström, 1981) ”That is right and as a poor father of two children it would’ve been tempting, but I understood the consequences – I would’ve lost my credibility in the future”, Ekblom recalls today. There was a professor of cardiology who said: ‘You must have made something wrong; this is not possible. The viscosity will increase and you will have reduced circulatory performance during heavy exercise’. That sentence would set the tone of the discussion for the next decade to come. Meanwhile, research on manipulation of the other links continued, and two additional studies coauthored by Ekblom were published in 1972. One dealt with “blocking” a portion of hemoglobin by inhaling carbon monoxide, which had higher affinity to hemoglobin than oxygen. Unsurprisingly VO2max and performance fell significantly when a large amount of RBCs were rendered unusable. Another interesting venue was limiting maximal heart rate by administering two beta blocker – substances: atropine and propranolol to hinder heart function and to keep hear rate artificially low. When the body couldn’t increase oxygen flow to muscles by increasing heart rate even when muscles had a high demand for oxygen, there were two compensatory mechanisms. The body increased the stroke volume above earlier presumed “maximal” levels and it also increased the relative amount of oxygen used by the muscles. Correspondingly, maximal oxygen uptake was lowered by just 6 percent, which was statistically negligible. One could deduct that this showed the body’s enormous capabilities when it adapted if one link was manipulated down. Another plausible scenario was that central circulation wasn’t the key limiting factor or at least not the end of the story about what limits Vo2Max. *Some remarks made by Melvin H. Williams (1938-2016) with no reference are based on our email-correspondence that took place in 2014. They measured submaximal heart rates and time to exhaustion and observed minor but mostly inconsistent declines in heart rates in every group, an effect that was most evident in the “whole blood” group. Still, their statistical analysis revealed no differences between the four groups, and correspondingly, Williams and his coauthors concluded that with the limitations of the study, blood doping didn’t work. Thus the first two published attempts taking place outside Sweden to test the underlying theory behind the Swedish researchers’ blood-doping hypothesis failed. Ekblom continued to focus mostly on his own work and avoided confrontation in dealing with skepticism. Still a decade later he wrote that “some very serious mistakes occurred in these studies”, (Ekblom, 1982) and if he had seen the test protocols beforehand, he likely would have predicted the outcome since he had firsthand information about similar mistakes made a few years earlier. “We had done exactly the same mistakes in our own pilot studies in the late 1960s”, he thinks about the obvious similarities. In addition to using only half the amount of blood and reinfusing it back in only 21 days, a week earlier than Ekblom and Goldbarg had, one of the mistakes was that the authors of the Williams et al study didn’t gather any hematological data, so in hindsight it isn’t certain that there was an increase in hemoglobin concentration at all. Still, Williams and his co-authors appear to have been sincere and honestly confused and surprised about the findings spending a full third of the research paper on various possible reasons to explain why the method didn’t work. They notice a similarity between high altitude studies with inconclusive results. ”These findings may be analogous to studies which have shown that polycythemia associated with training at altitude exerts no beneficial effect on maximal oxygen uptake or performance on subsequent return to sea level”. The Finnish findings can also be explained by the same problem because the amount of blood reinfused in the Finnish research was only 400-600 milliliters – only half of what Ekblom and Goldbard had used – and the research paper is strikingly similar with the earliest inconclusive tests. The authors didn’t find significant performance enhancement even when they concluded correctly that the ”prerequisite for a possible benefit from autotransfusion is that hemoglobin level and [hematocrit] recover sufficiently within 2 to 3 weeks”. Their study didn’t meet this condition and the volunteers were clearly anemic when the reinfusion took place, hematocrit being almost the same before blood removal (42.2 %) and after reinfusion (43.3 %). Melvin Williams met Åstrand in many conferences and Tapio Videman visited the GIH at least once (in March 1973) with the best Finnish cross-country skiers, when the 6”5 skier Juha Mieto broke the absolute Vo2Max world record with gigantic his oxygen engine of 7.40 l/min when he was tested by Bengt Saltin. Unfortunately, Ekblom can’t recall what types of discussions took place about the subject-of-the day. “Whether Melvin – whom I knew well – or Videman discussed the matter with us when they visited the GIH, I don’t remember, but it is likely that we did, particularly when it was P-O Åstrand who initiated visits and discussions on various subjects”, Ekblom recalls. If many of the so-called ”real” physiologists and medical doctors had looked down on exercise physiologists and the research undertaken at the GIH because they didn’t do ”real” worthwhile science, the opposition that came from within sport circles was of an almost totally different type of nature. Björn Ekblom also noticed two decades later that the attitude of coaches wasn’t that better when with Per-Olof Åstrand he explained the research conducted at the GIH to one journalist who was visiting the institute. The key area of improvement would be individual training programs and Ekblom considered the ”one-size-fits-all” training papers worthless and while a football enthusiast and a coach himself, he even preferred individual exercise to a large extent as time-saving when compared to group training that took up to three hours at a time. An R&D research center of blood dopers? In 1971, the Belgian cycling superstar Eddy Merckx was at the height of his career but skipped that year’s edition of the Tour of Italy. The Tour was subsequently won by Gösta Pettersson, who had been tested by Björn Ekblom and a participant of his study from the late 1960s that measured cardiac outputs. The physiologist commented on Pettersson’s physiology in the media when the cyclist had managed to become one of the few Swedes to compete at the international elite level in cycling. Pettersson complained regularly in 1970-1971 about his anemia and was infused with sugar solution and iron shots by the Italian team doctor of his Ferretti team, even when Ekblom hadn’t been that worried about the low hemoglobin concentrations as such of athletes with superior hearts. One can only speculate what kind of thought went through the minds of his competitors when the existence of blood doping was revealed only a few months after his Tour of Italy win, but we do know that some French cyclists did ask Ekblom for assistance with the blood doping process and Pettersson’s main rival Eddy Merckx has later revealed that the Belgian was offered a possibility to use transfusion when the attempted to break the hour record in 1972. 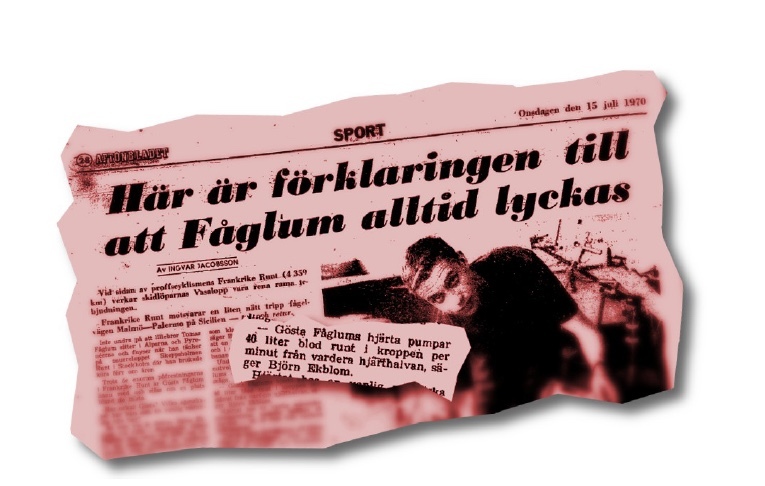 ”Here is the explanation why Fåglum always succeeds”, was one 1970 headline of an article in which Björn Ekblom describes how triumphant cyclist Gösta ”Fåglum” Pettersson’s heart pumps 40 liters of blood each minute contributing to his enormous oxygen uptake. (Jacobsson, 1970) After the ”invention” of blood doping became known a year later, the most cynical people wondered how much Ekblom’s ”method” was the ”real” reason for any Nordic success. What we do know is that later triumphant athletes from the Nordic countries wouldn’t be so lucky and the first ”real” target of blood doping accusations was found only shortly thereafter. Only shortly after blood doping became known as a method in fall of 1971, it was reported that 23-year old cross-country Sven-Åke Lundbäck recorded the highest relative oxygen uptake ever at the GIH laboratory, 87 ml/kg/min. *Dagens Nyheter journalist Bobby BystroÅNm questioned the claim about LundbaÅNck on the grounds there was no reason for LundbaÅNck not to triumph in the preceding major competitions (1974, 1976) if blood doping was a ”guaranteed way to medals” (BystroÅNm, 1980). The Finnish biographer of Viren also don’t believe in the LundbaÅNck-gossip in the actual book but considered that ”miracle method that everyone else certainly used” was only an easy way to explain one’s own bad success. The discussion was very heated also in Sweden and already in 1971 steeplechaser Anders Gärderud mentioned in passing being interested in testing the method when the issue was the first time a news item. (Carlsson, 1971b) At the same time one journalist recalled hearing rumours that Swedish athletes had taken blood transfusion for the Mexico pre -Olympics (Olofsson, 1971) and a year later wrestler Pelle Svensson (world champion) named in his provocative book Öppet Brev Till Sveriges Idrottspampar in 1972 one Swedish swimmer by name as a ”guinea pig” of blood reinfusion experiments. (Svensson, 1973) Some media outlets claimed that the alleged physiologist of the latter experiment was none-other-than Bengt Saltin, and interestingly Svensson had been a participant of the Saltin’s 1965 high-altitude expedition (with some ten other athletes, among them cyclist Gösta ”Fåglum” Pettersson and steeplechaser Anders Gärderud) where Saltin had made some remarks about the use of blood transfusion as one option, so the people involved could’ve heard at least some speculation about the method. With all this evidence, there is an apparent mystery there – how could the method that was revealed in September 1971 be in use first time up to three years before that and how come the Finnish sports circles were aware of the method beforehand? There are many possible answers to this question. Aside of the possibility that the Finns had invented the method on their own, they could’ve built upon the Swedish research having heard about the line of research, because dozens of Finnish exercise physiologists and sports MDs participated in the 1966 conference held in Finland where the first inconclusive results of Ekblom and Åstrand were discussed. Kaarlo Hartiala – who was the 1968 chief doctor of the Finnish summer Olympic team – also participated in the conference and was very well connected with the Swedish researchers relating to the high altitude adaptation research. After my own experience [with blood reinfusion], I understood that this would be doping – no doubt about it. But how much this was used during the 60’s and early 70’s I do not know. How the accusations fell out during that time I do not remember – just that I denied all allegations that I and others Peo would’ve been involved in the matter. In one conversation I got confidential information – ‘ He went to a hospital to treat his anemia, but one doesn’t get three blood bags to treat anemia of a well-trained athlete’. The same argument has been used when athletes develop so-called ‘sports anemia’ and it must be taken care that he must have blood. After these newspaper comments I actually got some threats both from those who thought who he was and from those who had some questions to answer for. Our impression was that we could see the difference between frozen and fresh blood in the size of red blood cells, their age and perhaps from something else. We got the tip from a hematologist but didn’t proceed with this thing – pretty stupid from our part. I certainly think that some people had the interpretation that the method was unethical but unfortunately allowed because it wasn’t banned – mostly to give the Swede the same preconditions that the athletes from the other countries had. I can certainly hear the same interpretation yet today about many things – high altitude housing, pressure dressing during exercise etc. Ekblom – who had become a coach of the Swedish Speed Skating Union in 1964 and researched the physiology of that sport extensively – recalls having been at the Davos camp and that many blood samples were indeed drawn as the effect of altitude was researched and he also later has recalled having discussed about ongoing blood reinfusion research with Nilsson during the late 1960s. ”I know that I brought a bicycle ergometer with me to Davos and we did lactic acid test”, he recalled the training camp over thirty years after the incident. ”Perhaps we did blood volume tests to Jonny Nilsson”. Even when their recollections about what happened in the late 1960s diverge, Nilsson has wanted to emphasize that it was it wasn’t doping but a research project, nothing else. ”Björn is not a wrongdoer”, he wanted specifically emphasize regarding the Davos-incident in 1999. *Ekblom traces back his reluctance to participate in doping being heavily influenced by his experiment in a one-night orienteering race when he had a magnificent race almost until the end, but he took an illegal choice of route and should’ve been disqualified. ”Nobody asked about the thing, but cheating it certainly was”, Ekblom recalls the incident today. ”I felt so ashamed about the second place in the competition that I decided never to cheat again”. Not only being an eminent physiologist, Ekblom was also an accomplished orienteerer and the Swedish champion of night-orienteering in 1964. Whereas the research trends and results of the 1960s stressed the importance of the ”central” factors in limiting maximal oxygen uptake, there was another line of research that started to gain momentum around the time when the blood doping research started. John Holloszy was an eminent physiologist and very modestly leaves out that the ”accumulation” started in 1967 when his outstanding research paper was published by the Journal of Biological Chemistry shows that there was enormous adaptability at the muscle level associated with endurance exercise, of which the most eminent was a huge increase the in the mitochondrial content of the trained muscle. (Holloszy, 1967) Mitochondria are the sites that ”consume” the oxygen, so theoretically doubling the amount could double the oxygen consumption capacity of muscles at least at the peripheral level. While at first look this doesn’t look such a big deal, the implications were clear. If the vulgar and simplistic version of the central limitation theory went that Vo2Max was related only to the amount of oxygen delivered by heart, why was there any kind of adaptation at the peripheral level at all? To add validity to the importance of the peripheral factors as a possible key limitation of Vo2Max, Lennart Kaijser from the Department of Clinical Physiology of the Karolinska Institutet took an attempt to modify the amount of oxygen delivered to the muscles and conducting various types of performance tests on his subjects for his doctoral thesis published in 1970. Unlike some researchers who had used different mixtures of oxygen and air, Kaijser used high air pressure generated in a hyperbaric chamber, where oxygen availability to the muscles should’ve been higher. Whereas breathing of oxygen ”enriched” air had increased Vo2Max pretty consistently in research papers since the 1920s, this didn’t take place this time with higher air pressure and unlike expected, the data didn’t support the theory that the muscles could use the extra oxygen offered. Whereas Kaijser’s work dealt with acute manipulation of the system, of Ekblom’s closest colleagues particularly Bengt Saltin was very interested in what types of changes endurance training caused in muscle and in the mid-1970s he coauthored the famous experiment when the scientists tested how weeks of endurance training using only one leg cycling affected Vo2Max figure of both the trained and the untrained leg. *Saltin and his coauthors also wrote in the paper that the findings ”focuses attention on peripheral factors as being at least as essential for the cardiovascular performance during exercise as any central factors”, adding that German researcher named Muller came to the similar conclusion ”already in 1942”. Saltin would later write many chapters on books and papers on the history of thought of exercise physiology. Ekblom’s view today is that there could be a difference in different types of sports such as cycling vs. running, where, in cycling the peripheral factors and muscle level adaptation can play a relatively more important role. “It deals with the question of P50 and mitochondrial capacity and function”, Ekblom said of what he sees as the most pertinent peripheral issues today. ”Everything is not clear”. The question was of importance to him even in the 1970s when he tested how various combinations of limbs affected Vo2Max and there was even discussion in the decade about a paper on how blood doping affected the performance of isolated limbs, but as time was a scarce resource, the study never materialized. But one test was conducted using only arm work after reinfusion. While there was no increase in Vo2Max, time to exhaustion did increase. Ekblom’s blood doping research is barely mentioned in this research on the peripheral limitation theories, but his other research was of great interest to the scientists interested in the muscle adaptation to aerobic exercise. It didn’t go unnoticed that Ekblom himself had observed that Vo2Max barely fell even after cardiac output had been reduced by some 12 % in the 1972 beta-blockade experiment when maximal heart rate was reduced by some 30-40 beats. Holloszy also found it most relevant that in many longitudinal training studies the increased stroke volume of heart accounted only roughly half of the increased Vo2Max whereas the other half was that muscles could use more of the oxygen of every given unit of blood leaving left ventricle. (Holloszy 1973) Holloszy concluded that oxygen consumption wasn’t only about oxygen delivery but that other factors were equally important. If it wasn’t clear what to make about this material in the 1970s and how to contrast it with the emerging blood reinfusion research, the muscle itself became a real research topic from endurance viewpoint and there evidently happened a lot at the peripheral level. This is part three of a multi-part series titled “Limiting Factors – A Genesis of Blood Doping”.